Erick McCollum graduated from GC in 2010 with a business degree. Since graduation, he has played basketball professionally for some of the top basketball teams in Greece and Israel and is currently playing in Turkey. Errick McCollum II holds the single season and career scoring records in basketball at Goshen College. In the spring of his senior year in 2010, as a 6’1” guard, he executed a soaring dunk that became an ESPN SportsCenter’s Top 10 play. But unlike the majority of Goshen College students, McCollum never traveled abroad en route to earning his undergraduate degree. His credentials as a global citizen came later, courtesy of his ability to speak with the basketball in any language. This year, McCollum, who is 29, is playing for Galatasaray Odeabank of the Turkish Basketball Super League. In August 2016 McCollum signed with the Beikong Fly Dragons of the Chinese Basketball Associatio, and in March 2017 he returned to Turkey for the remainder of the season. In the 2011-2012 season he played professionally in Israel, where he topped the league in scoring, averaging 24.3 points per game and scoring a high of 40 points in one game. In the 2012-2013 season he played professionally for the Greek club Apollan Patras, and the Greek club Panionios in 2013-2014. In the summer of 2014 McCollum joined the Denver Nuggets for the NBA Summer League before singing a one-year deal with the Chinese Basketball Association’s Zhejiang Golden Bulls. McCollum said that his parents predicted that they would have two professional athletes in their family. Friends used to laugh at the claim, he said, but they no longer do. McCollum’s younger brother, C.J., who plays for Lehigh University, was a two-time Patriot League player of the year and the nation’s fifth-leading scorer as a junior last season. C.J. McCollum led Lehigh, a No. 15 seed in the N.C.A.A. tournament, in knocking off Duke, the No. 2 seed, March of 2012. C.J. is currently playing in the NBA for the Portland Trail Blazers, and in the 2012-2013 season was named the League’s Most Improved Player. “My parents always knew we had the ability and talent, and they put us in the position to gain every opportunity we could get,” Errick McCollum said. McCollum excelled in high school ball in Canton, Ohio, but his size turned away many Division I schools. Goshen College didn’t hesitate, and McCollum took a road less traveled in his journey to the pros. At Goshen College, he excelled, as a senior becoming the first Maple Leaf to be named conference player of the year. He averaged 25.6 points, 7.1 rebounds and 3 assists per contest and was named a National Association of Intercollegiate Athletics (NAIA) First Team All American. Even so, after graduating, McCollum, who earned a business degree, was uncertain about his future. He turned down several job offers and signed with an agent. “My agent said he saw the Top 10 play … [but] it takes a lot of things to go your way,” he said. After signing his first professional contract, McCollum packed up his bags and flew to Israel—his first trip abroad. 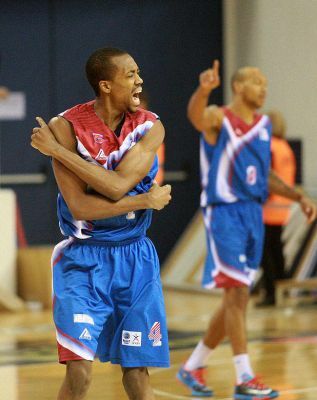 After two years of professional play McCollum had visited 10 countries and felt comfortable in transitioning to Greece for the 2012-2013 and 2013-2014 seasons. In college the basketball team did everything together, he said, as a tight-knit family. In the professional league, some of the players are 10 years older, with families of their own to go home to after the game. To get ready for playing in Greece, McCollum worked out all summer at home in Ohio, including playing with Lebron James in the Akron pro-amateur summer league. Their team took the championship for the second consecutive year. Once the regular season begins, the team rarely practices more than once per day. Even on those rare days the practice is less intensive, usually consisting of shooting or lifting in the morning and an afternoon practice. “After a month of that (preseason) terribleness everything gets calm,” he said. The team will play about 60 games, with a few days of rest between. McCollum notes that with such an intense game schedule, “you can’t really practice three hours a day like in college or your body will wear down.” A regular season team practice is normally two hours long, with shooting, stretching, and one-on-one and play drills. McCollum said this year offers stronger competition than he faced in Israel. “There are a lot of teams in Europe with very lucrative pay and who play at an extremely high level, but at the end of the day my ideal place to play is in the NBA,” he said. He aims to shoot more than 50 percent from the field, 40 percent from the 3-point line and 90 percent from the foul line. McCollum said that he’s met both the field goal and 3-point goals but is still working on the foul line percentage. He added that the No. 1 goal remains winning games. “That’s the first thing coaches and other teams look at for the following season recruitment,” he said. McCollum wants to keep his options open in business. He keeps his resume updated and accepted a part-time job in business over the summer. This will be his seventh year of professional basketball. He recalled that he had really lusted after Division 1 schools in high school. “I made the best of my situation and that was one of the best things that ever happened to me: going to Goshen College,” he said. During the off season in the States, he said his first stop is always his home in Canton to visit his parents and younger brother. His second stop is at Goshen College. McCollum said that at the end of his rookie season in Israel, he had respectable statistics but teams weren’t calling him with offers as he had hoped. The offer he would take came days before the start of the season.